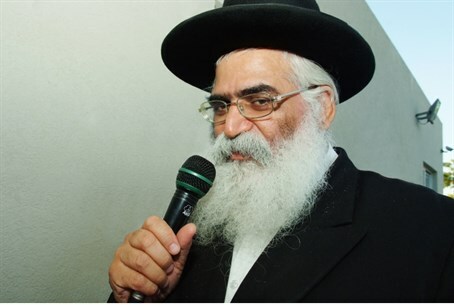 Rabbi Yoram Abergel has been arrested on suspicion of involvement in extortion and threats, in connection to the municipal elections in Netivot. Rabbi Abergel is known as a kabbalist who gives blessings. He is one of the wealthiest rabbis in Israel, with an estimated net worth of $9 million. Investigators have been looking into accusations that the Domrani crime family issued threats against the family of Rabbi Yaakov Ifergan – also known as “the X-ray” - another well-known and wealthy kabbalist rabbi in the city. Rabbi Ifergan was allegedly threatened over his support for candidate Eyal Mesika. Both crime kingpin Shalom Domrani and Rabbi Abergel supported the rival candidate, incumbent Yechiel Zohar. Zohar won the elections with roughly 58% of the vote. Abergel was arrested on suspicion of having played a part in Domrani’s campaign to use extortion and threats in Zohar’s favor. Domrani has been arrested as well. Rabbi Abergel was arrested in part because he had been planning a trip out of the country. Investigators decided to seek his immediate arrest in order to keep him in Israel for questioning. A court agreed that police could detain the rabbi, but rejected a request to jail him for 15 days, stating there is not sufficient evidence against him to justify a lengthy detention. Police have until Wednesday to question him, at which point he will be freed if there is no new evidence. Rabbi Abergel’s followers expressed outrage at the arrest and said the rabbi was not involved in any criminal activity. “He’s not involved in practical things, he’s involved in learning Torah,” one of his aides told Maariv/nrg. Rabbi Abergel’s attorney said the rabbi’s only connection with Shalom Domrani was that the crime kingpin had sought, and received, a personal blessing. The city of Netivot is not the first to be embroiled in post-elections scandal. The city of Beit Shemesh made headlines when several people were arrested on suspicion of elections fraud over the course of elections day; the resulting scandal has led to calls to redo the vote.